Garage door maintenance is something that every homeowner that also has a garage needs from time to time. If you live in Seagoville, TX, you must be included in that definition and we have the best service for those needs exactly. Leaving the garage door broken or malfunctioning because you can’t find any good repair service is now officially over. Let us begin with presenting Veteran Garage Door. 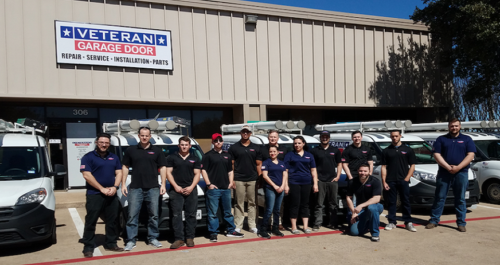 Veteran are here to take care of anything pertaining to garage door repair in Seagoville, TX. We offer a full service for each and every problem or need that relates to your garage door. Our team of professionals is available 24/7 and we provide same day service, so you know the service will be quick and top quality. As part of our service, our team is fully equipped with a fleet of service cars that are always on the road. We can fix every kind of problem for every kind of garage door. Our service also includes onsite estimates, for free. This way we can give you initial advice on what should be done in order for your garage door to be operating perfectly. Within the many services we give as the top garage door repair service in Seagoville, TX, you can find these: opener repair, bent tracks repair, noisy garage door repair, door off track repair and many more solutions for problems of that kind. As to garage door cable repairs, we handle: sensor repair, broken roller replacement, gear sprocket repair, capacitor replacement and much more. We also help with the installation of a smartphone-controlled garage door system, for every garage owner that likes having the control in their pocket. Our team of professionals will always give you the service you deserve with a smile on their face, because we believe you should love what you do. So, the next time you find yourself in a situation that requires a repair for your garage door anywhere in Seagoville, keep Veteran Garage Door in mind.